The front panel includes two USB 3.0 connectors and audio connectors. High-performance gaming systems need room to work with. 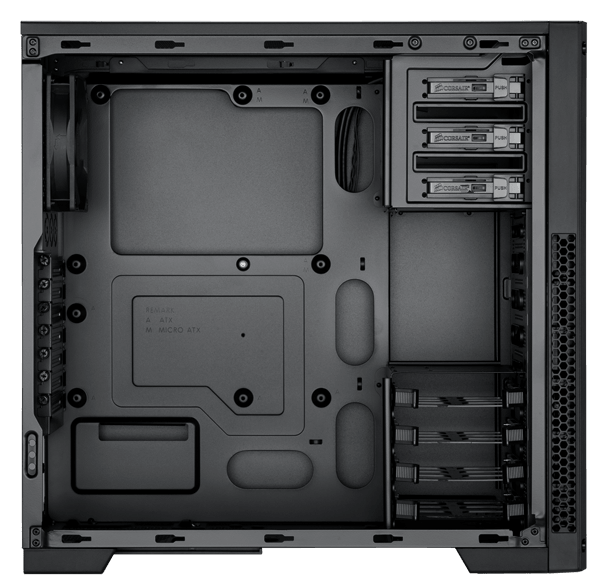 The compact 300R delievers the room you need to build your ultimate gaming PC. Room for graphics cards up to 450mm long. USB 3.0 front panel connectors. Built-in compatibility for SSDs in the four hard drive bays gives you the flexibility you need. Keep your system cool with up to 7 fan mount locations. Install or upgrade your CPU heatsink quickly with the easy-access backplate cutout. Dimensions: 19.1" x 8.3" x 17.7"
The 300R is equipped with two fans for intake and exhaust, and the integrated dust filters on the front and bottom intakes are easy removable. There's room for you to install five more fans, including mounting points for two side panel 120 mm fans for drawing cool air directly over your GPUs. If you're building a multi-GPU gaming rig, proper graphics ventilation is essential. 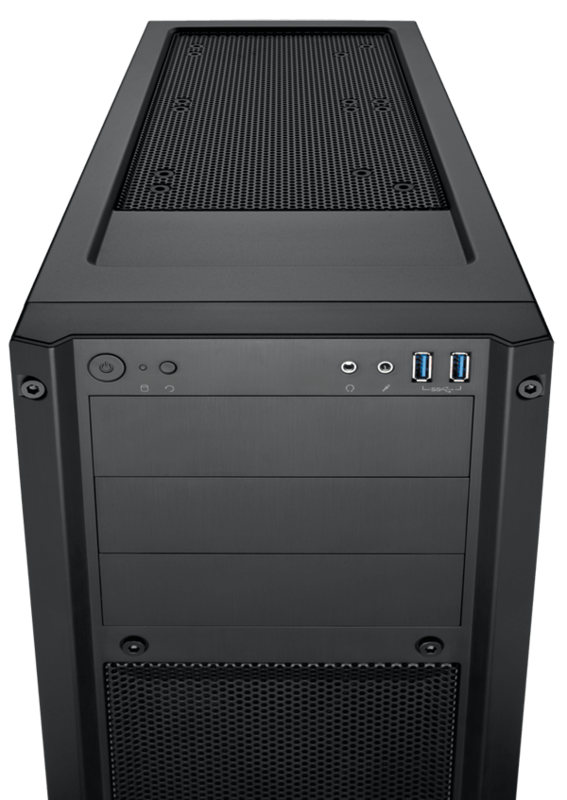 Despite its size, the 300R can fit extra-long graphics cards of up to 450 mm length, and it has three optical drive bays and four hard drive bays. All the bays are tool-free, and the hard drive bays have integrated support for 2.5" drives, so you won't need to deal with adapters when installing SSDs. Whether you're building multiple systems or just one, and whether you're a professional or if it's your very first build, the 300R has the smart features that matter. Just like the drive bays, the side panels are tool-free, so you'll spend less quality time with your screwdriver. The interior has a CPU cutout for quick installing or upgrading of CPU heatsinks, and Corsair's cable management system provides a straightforward way to route cables behind the motherboard, not across it where it can interfere with airflow and give your system a cluttered look.